Your home is exposed to a wide variety of risks throughout the year, whether it be storm damage or mold growth. When important aspects of your home are damaged, like siding or roofing, your first priority is to initiate the cleaning process and return to your normal home life. During times of tragedy and upheaval, it's beneficial to hire a restoration contractor who can restore your home. Of course, not all residential restoration contractors are properly skilled and trained, so it’s essential that you find a registered and licensed contractor. This post will cover the top reasons to hire an insurance restoration contractor when your home needs critical repairs. Storm damage restoration companies are experienced with working side-by-side with insurance companies after a storm. They will be able to assist you as you fill out the necessary paperwork for coverage. You may think it's simple to file a successful insurance claim; however, it's not as easy as filling out a form and receiving a check. Most insurance companies are cautious about falling victim to fraudulent claims. Restoration contractors understand the inherent challenges of insurance claims. Also, restoration services are covered under most homeowners’ insurance policies. During an inspection, the restoration contractor will perform a thorough assessment to determine the extent of the damage. This assessment will help them to determine the equipment necessary to restore your home, how long the project will take, and the general cost of the repairs. 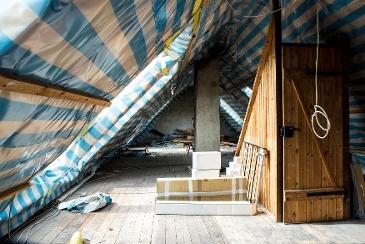 Trained restoration companies will know where to look to spot potential hazards (during the assessment period), making it easier to get rid of current problems, while working to prevent further problems. After all the trauma you’ve experience enduring home damage, it’s nice to receive peace of mind. Restoration contractors work with a full crew who can help you to clean up your home if you have experienced extreme damage. It’s important that damage is cleaned (especially water damage), as it will help to prevent mold and mildew from forming. If you are unsure if mold is beginning to grow in your home, read our post, "What Are The Warning Signs Of Mold?" At Built Right we will come to your home for a free, no obligation roof assessment and examine the damages to see what types of roof repairs or replacement you need. A lot of people don't realize that they qualify for insurance paid restoration, saving them money and the stress a damaged roof can cause. Whether you have good or bad credit, we can work with you to make sure that your home receives the necessary repairs. Contractor financing is convenient, as we help get the work done, while ensuring that it is affordable.